Overnight the streaming service Tidal revealed the cover for “You’re The Best Thing About Me”. The cover features Edge’s daughter Sian on the cover, in a blue tinted image. She’s wearing the same helmet as in the prior picture of Sian and Bono’s son Eli that was shown during concerts on tour. NOTE: Tweet has since been removed. Will Tidal release the U2 song early? No idea, but we are doubtful. Currently the new music release date worldwide is Friday. Services like Tidal are set up around introducing new music on Friday. 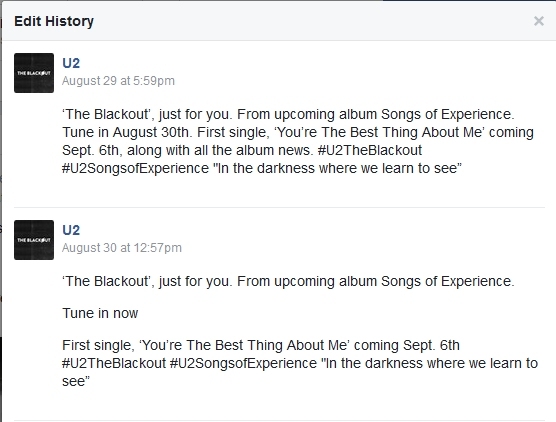 U2 has announced the new single will be ready on September 6, which is a Wednesday not the typical Friday release. It is possible it was delivered to Tidal already for addition, but a mistake was made thinking it was a typical Friday release. Tidal has been removing references to this release from their site. Right now it’s possible it’s just an error caused by the odd release date. But we will let you know if it does start to stream there this weekend instead. Many thanks to mrharmonia, dannymuso and AtomicCollector on Twitter for sending us information on the above. The information that ‘all the album news’ would be revealed on September 6, has been removed from the announcement. Does that point towards a change in the album announcement? Possibly. If the album date is December 1, the band can still wait a bit to announce the album. It only has to be delivered mid-October in order to have a physical release in stores for December 1. It takes about six weeks to prepare for such a release we are told. Delaying the announcement may allow them some freedom to make additional tweaks to some aspect of the album they are not happy with such as release formats. IMAGE: Edits on Facebook Happened at 11:57 EST, Three minutes before Video played. The change to the text was also made when the video was put up live. Instead of the song ‘coming soon’ they had to change the text to show that the video was now available. Perhaps in that transition it just got missed. Or maybe it was excluded because they didn’t want media focused on the new album instead of the new songs? Or maybe they’ve decided to hold off on announcing all of the details for now. Finally, there was some news about some last minute mixes of the single “You’re the Best Thing About Me” from a user on Intstagram. In the post, now removed, he claims that a few days ago, he was messaged by Steve Lillywhite, asking him to assist on mixing a newly recorded version of “You’re The Best Thing About Me”. He had been part of the session to mix the final version last year as well. Mixing started at 11PM, and continued until 3AM, they broke, and worked between 8AM and 10AM, and the song was sent. At that point they found out another mixing engineer in London had also been working on the same track, but it was the version by Steve Lillywhite which will be released, from this newly recorded version, not the recording the Lillywhite had mixed last year. Thanks to the gang at U2 en Espana for the heads up on that news. The video on Facebook is reaching 4 million views. At 8am EST it was sitting at 3,930,798 views. Take a minute and go back and watch it a few more times on Facebook, lets help this song get some views. Just hit play below and give it another watch.